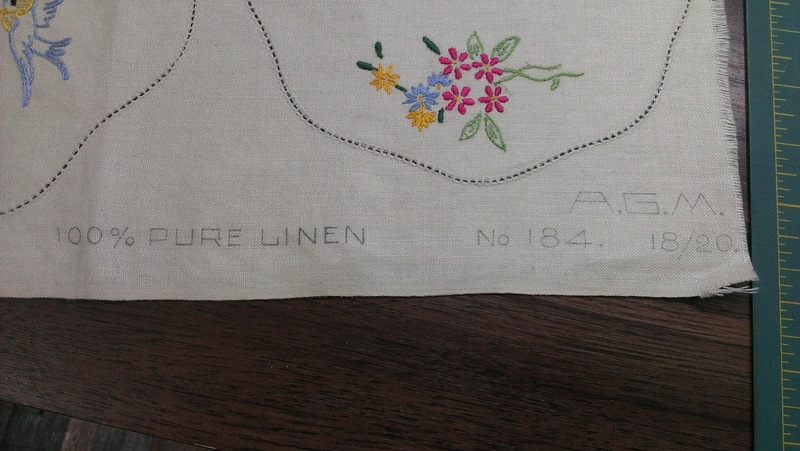 Some time ago my dad's sister gave me some embroidery 'blanks' (I'm sure they have a 'proper' name, but I don't know what that might be). They belonged to her mum or her aunt Hillary. It's difficult to date them, but there are some brand notations on the edges of a couple, and I've tracked down some similar pieces from the 1940s. What is an 'embroidery blank' exactly? Cloth with a outline drawing, which you embroider over. 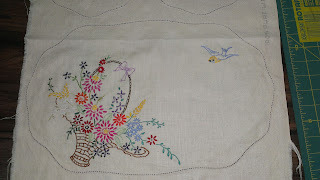 Most are linen, edged ready for tatting or crochet finishes to make up doilies or tray clothes. I've got flowers, birds, butterflies, some girls playing tennis, and some lovely ladies in crinoline. Some of them have been started and my goal is to eventually finish them all. I don't know how to do the edge stitching. Might have to get someone to teach me that skill. Once they're finished, I'll pass them back to the rest of dad's family. I'm not sure what use any of us have for embroidered doilies and tray clothes, but they're the sort of thing you hand on down through the generations. 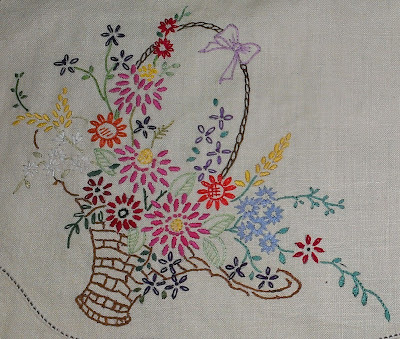 I've been working on a particularly lovely basket of flowers for a couple of weeks now. I finished the last leaf tonight. 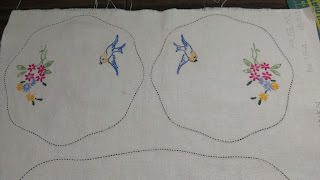 I find stitching while watching TV stops me from wanting to nibble. I'm not hungry, just need to keep my hands busy. Tray cloth. 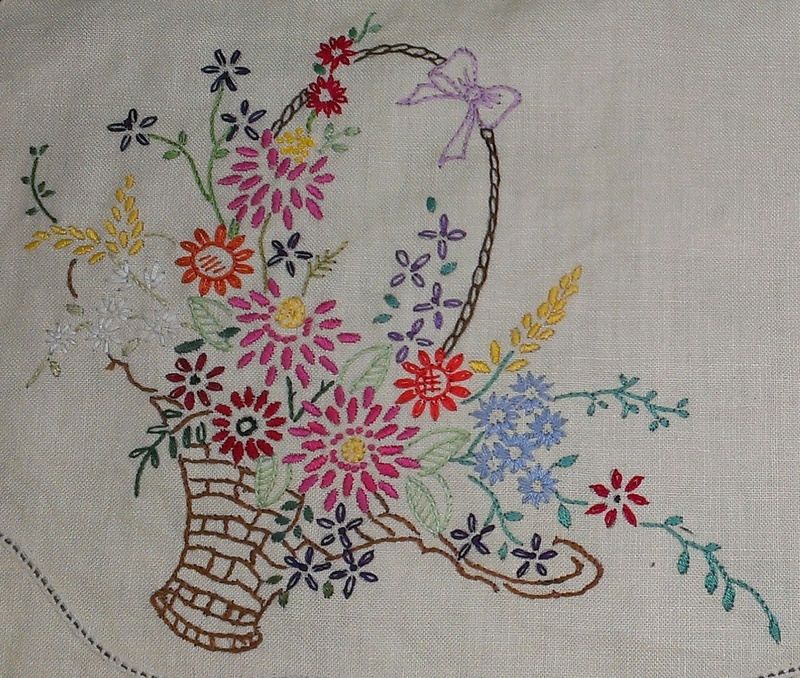 The basket and a few flowers were already stitched. Two doilies. These were already stitched. Not a lot to go on, but enough for Google to give a tentative date.